While it happens a lot less now than a couple of years ago, I still see the question of why SSDs are worth it every now and then. Rather than give my usual answer, I put together a little graph to illustrate why SSDs are both necessary and incredibly important. Along the x-axis we have different types of storage in a modern computer. They range from the smallest, fastest storage elements (cache) to main memory and ultimately at the other end of the spectrum we have mechanical storage (your hard drive). The blue portion of the graph indicates typical capacity of these storage structures (e.g. 1024KB L2, 1TB HDD, etc...). The further to the right you go, the larger the structure happens to be. The red portion of the graph lists performance as a function of access latency. The further right you go, the slower the storage medium becomes. This is a logarithmic scale so we can actually see what’s going on. While capacity transitions relatively smoothly as you move left to right, look at what happens to performance. The move from main memory to mechanical storage occurs comes with a steep performance falloff. We could address this issue by increasing the amount of DRAM in a system. However, DRAM prices are still too high to justify sticking 32 - 64GB of memory in a desktop or notebook. And when we can finally afford that, the applications we'll want to run will just be that much bigger. Another option would be to improve the performance of mechanical drives. But we’re bound by physics there. Spinning platters at more than 10,000 RPM proves to be power, sound and reliability prohibitive. The majority of hard drives still spin at 7200 RPM or less. 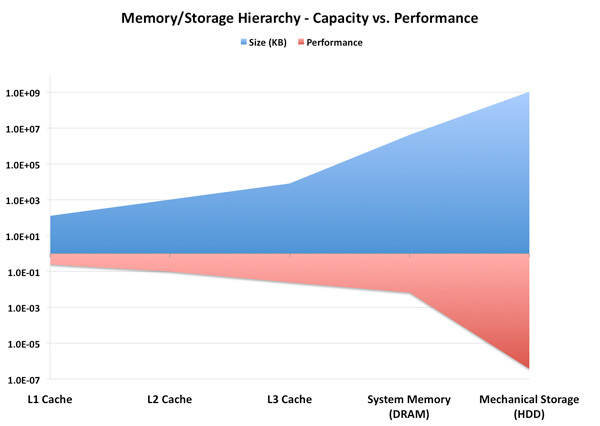 Not only have we smoothed out the capacity curve, but we’ve also addressed that sharp falloff in performance. Those of you who read our most recent VelociRaptor VR200M review will remember that we recommend a fast SSD for your OS/applications, and a large HDD for games, media and other large data storage. 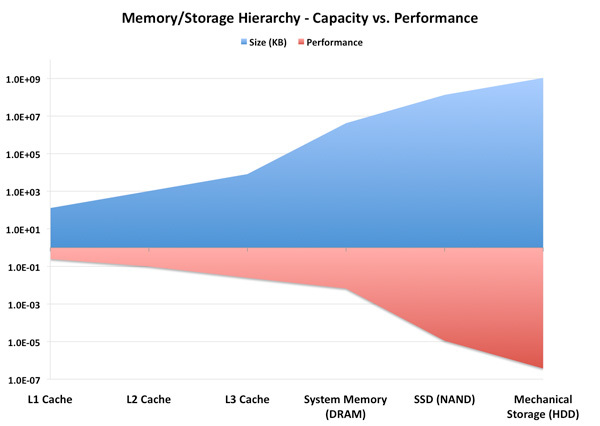 The role of the SSD in the memory hierarchy today is unfortunately user-managed. You have to manually decide what goes on your NAND vs. mechanical storage, but we’re going to see some solutions later this year that hope to make some of that decision for you. Why does this matter? If left unchecked, sharp dropoffs in performance in the memory/storage hierarchy can result in poor performance scaling. If your CPU doubles in peak performance, but it has to wait for data the majority of the time, you’ll rarely realize that performance increase. In essence, the transistors that gave your CPU its performance boost will have been wasted die area and power. Thankfully we tend to see new levels in the memory/storage hierarchy injected preemptively. We’re not yet at the point where all performance is bound by mass storage, but as applications like virtualization become even more prevalent the I/O bottleneck is only going to get worse. It’s this sharp falloff in performance between main memory and mass storage that makes SSDs so enticing. I’ve gone much deeper into how these things work already, so if you’re curious I’d suggest reading our SSD Relapse. SSD performance is basically determined by three factors: 1) NAND, 2) firmware and 3) controller. The first point is obvious; SLC is faster (and more expensive) than MLC, but is limited to server use mostly. Firmware is very important to SSD performance. Much of how an SSD behaves is determined by the firmware. It handles all data mapping to flash, how to properly manage the data that’s written on the drive and ensures that the SSD is always operating as fast as possible. The controller is actually less important than you’d think. It’s really a combination of the firmware and controller that help determine whether or not an SSD is good. For those of you who haven’t been paying attention, we basically have six major controller manufacturers competing today: Indilinx, Intel, Micron, Samsung, SandForce and Toshiba. Micron uses a Marvell controller, and Toshiba has partnered up with JMicron on some of its latest designs. Of that list, the highest performing SSDs come from Indilinx, Intel, Micron and SandForce. Micron makes the only 6Gbps controller, while the rest are strictly 3Gbps. Intel is the only manufacturer on our shortlist that we’ve been covering for a while. The rest of the companies are relative newcomers to the high end SSD market. Micron just recently shipped its first competitive SSD, the RealSSD C300 as did SandForce. We first met Indilinx a little over a year ago when OCZ introduced a brand new drive called the Vertex. 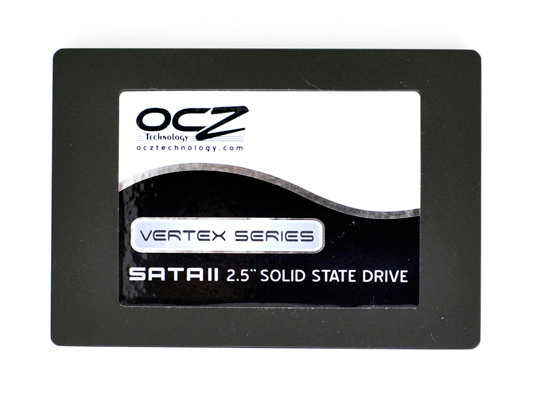 While it didn’t wow us with its performance, OCZ’s Vertex seemed to have the beginnings of a decent alternative to Intel’s X25-M. Over time the Vertex and other Indilinx drives got better, eventually earning the title of Intel alternative. You wouldn’t get the same random IO performance, but you’d get better sequential performance and better pricing. 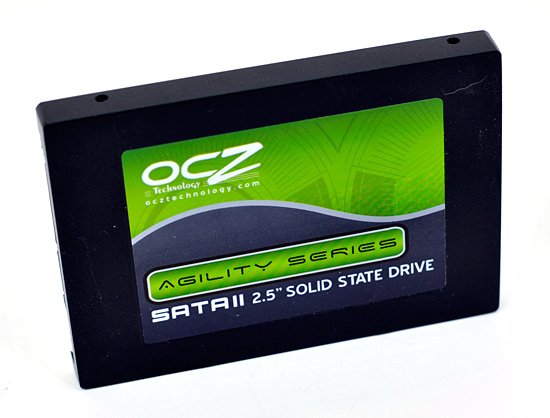 Several months later OCZ introduced another Indilinx based drive called Agility. Using the same Indilinx Barefoot controller as the Vertex, the only difference was Agility used 50nm Intel or 40nm Toshiba NAND. In some cases this resulted in lower performance than Vertex, while in others we actually saw it pull ahead. OCZ released many other derivatives based on Indilinx’s controller. We saw the Vertex EX which used SLC NAND for enterprise customers, as well as the Agility EX. Eventually as more manufacturers started releasing Indilinx based drives, OCZ attempted to differentiate by releasing the Vertex Turbo. The Vertex Turbo used an OCZ exclusive version of the Indilinx firmware that ran the controller and external DRAM at a higher frequency. Despite a close partnership with Indilinx, earlier this month OCZ announced that its next generation Vertex 2 and Agility 2 drives would not use Indilinx controllers. They’d instead be SandForce based.